This is followed on the next page along with a breathtaking spread of the little boy in a tiny boat bobbing above an extraordinarly enormous blue whale. 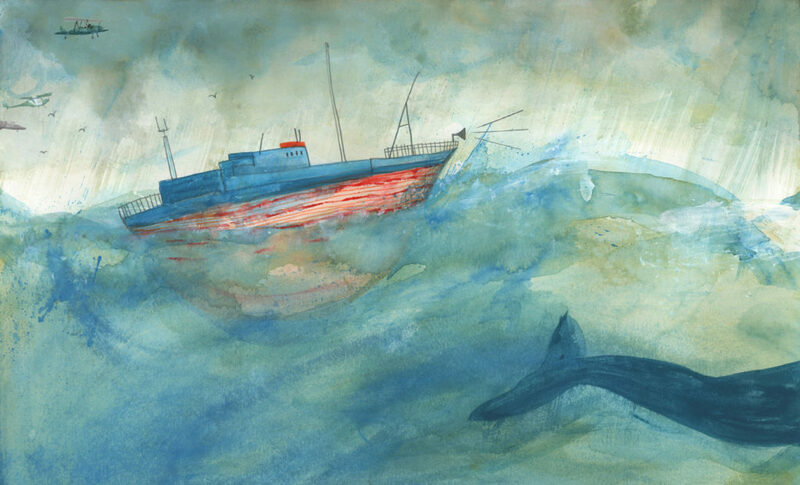 The text reads, “He read that the blue whale is a mammal of gigantic size and strength. It is the largest living creature on our planet.” We, as the reader and viewer, are immediately filled with the awe and the majesty of the whale and we want to know more. Page by page disseminates fascinating whale facts. Size, eating, weight, eye size, wonderful, beautiful, extraordinary details. More, I want to know more, because I can’t believe I didn’t know these things! 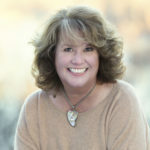 Whenever Jenni Desmond can she uses very kid-friendly examples to relate and explain. For instance, “…blue whales exhale through two nostril-like blowholes, blowing air as high as 32 feet (the height of nine seven-year-old boys).” This text is accompanied by a fantastic spread showing a tiny boat with 7 kids standing on each others’ shoulders and, of course, the gigantic whale swimming underneath and rising to the top of the waves to exhale. No page disappointed. Each was filled with interesting information that I really didn’t know. And the same can be said for the artwork. Handled like gorgeous fine art watercolors found in the most lyrical picture books, here it followed a factual and informative narrative. Absolutely stunning compositions and intriguing use of color and technique make you want to turn to the page to see what’s next. I was so happily surprised by this book that I really wanted to share it with you. Jenni Desmond has found a way to intrique us with interesting facts and combine them with such beautiful illustrations that it does, indeed, read as a picture book and not a non fiction reference book. Lovely, lovely, and kids of all ages will enjoy and learn from it. I certainly did! 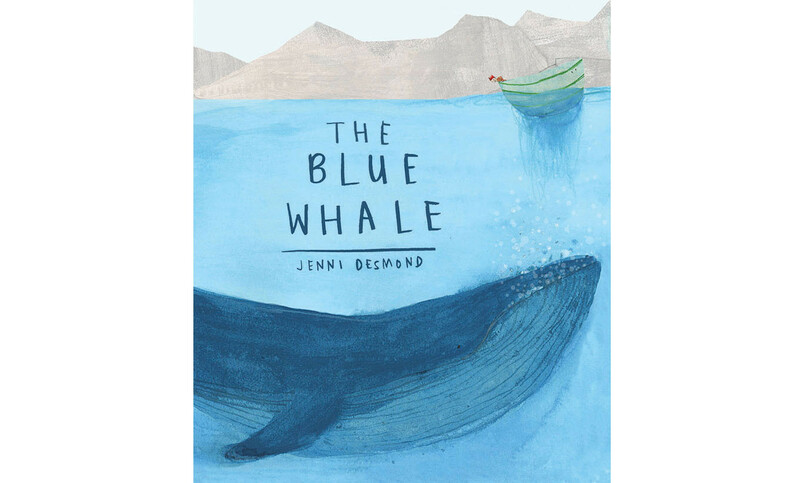 Jenni Desmond, Jennifer Black Reinhardt, nonfiction picture books, The Blue Whale. Bookmark. Great book to highlight, Jennifer! I remember when I first read it. I loved the way she conveyed the facts through a child’s experience. I’m so glad you liked the book, Traci! Thank you for visiting!!!! Hi Andrea! Yes, it is! This will be a good mentor text for me as I dive in to revisions on my nonfiction story. Thanks, Jennifer! When I read this I could almost hear the whale’s echolocation. It looks and sounds wonderful! Thanks for this! What beautiful art! Is the author the illustrator? Gotta get this one! Yes, Mary! Jenni is both! Thanks! You are too kind, Maria! Thank you!!! Couldn’t agree more—this is a special one. I love how creatively the nonfiction facts are presented in this book. 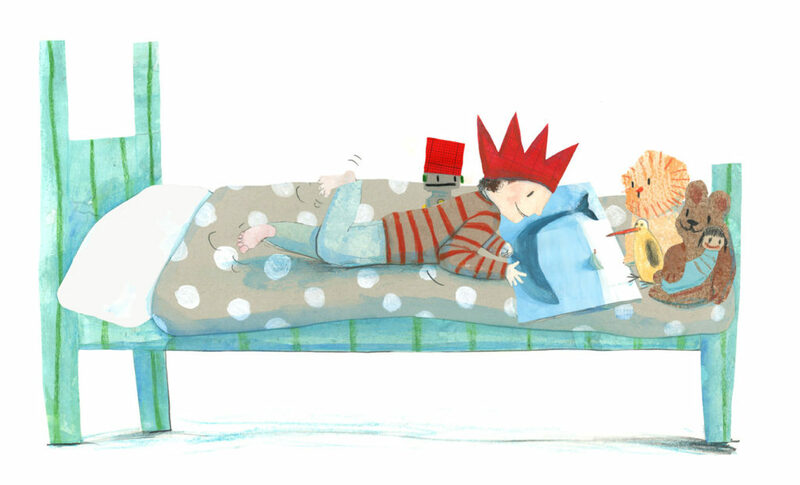 Lovely illustrations, too! Thanks to all for visiting and taking the time to comment! Ooo, this book looks so luscious and the art totally original! Thanks for introducing it, Jennifer! Oh, wow, Jennifer. This looks both gorgeous and fascinating. Thanks for sharing! Looks like a wonderful example of narrative non-fiction. This looks so good. 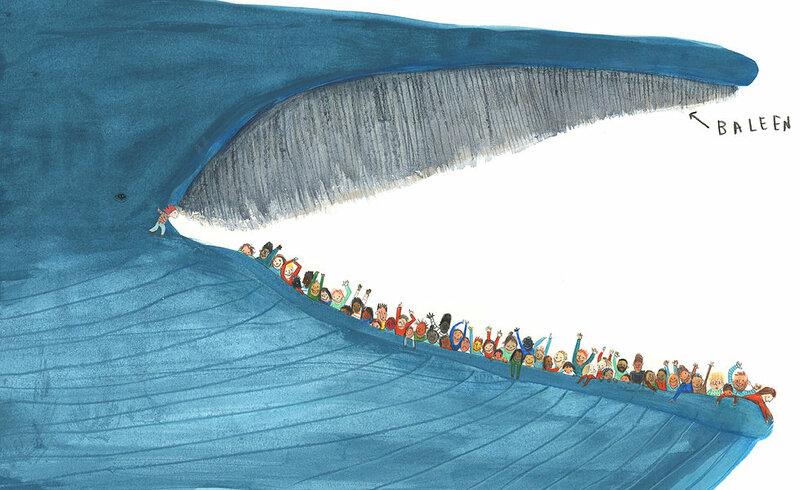 Love the illustration of the people in the whale’s mouth! Thanks for sharing this, Jen!